Trends in test and measurement systems follow broader technological trends. A measurement device’s fundamental purpose is to translate a measurable quantity into something that can be discerned by a human. As such, the display technology of the day informed much of the design and performance limitations of early electronic measurement systems. Analog meters, cathode ray tubes, and paper strip recorder systems dominated. Measurement hardware could be incredibly innovative, but such equipment could only be as good as its ability to display the measurement result to the user. Early analog multimeters could only be as accurate as a person’s ability to read to which dash mark the needle pointed. In the early days, the broader electronics market was still in its infancy and didn’t offer much from which to draw. Test equipment manufacturers developed almost everything in house, including display technology. In its heyday, Tektronix even manufactured its own cathode ray tubes. As the nascent electronics market matured, measurement equipment evolved to leverage the advances being made. Display technology stopped being such an integral piece. No longer shackled with the burden of developing everything in house, equipment makers were able to develop instruments faster and focus more on the measurement elements alone. Advances in digital electronics made digital oscilloscopes practical. Faster and cheaper processors and larger memories (and faster ADCs to fill them) then led to digital oscilloscopes dominating the market. Soon, test equipment was influenced by the rise of the PC and even began running consumer-grade operating systems. Measurement systems of the future will continue to follow this trend and adopt advances made by the broader tech sector. Of course, measurement specs will continue to improve, driven by newly invented technologies and semiconductor process improvements. But, other trends will be just as important. As new generations raised on Apple and Android smartphones start their engineering careers, the industry will give them the latest advances in user interfaces that they have come to expect. We are already seeing test equipment start to adopt touchscreen technologies. This trend will continue as more focus is put on interface design. The latest technologies talked about today, such as haptic feedback, will appear in the instruments of tomorrow. These UI improvements will help engineers better extract the data they need. As chip integration follows its ever steady course, bench-top equipment will get smaller. Portable measurement equipment will get lighter and last longer as they leverage low-power mobile chipsets and new battery technologies. And the lines between portable and bench-top equipment will be blurred just as laptops have replaced desktops over the last decade. As equipment makers chase higher margins, they will increasingly focus on software to help interpret measurement data. One can imagine a subscription service to a cloud-based platform that provides better insights from the instrument on the bench. At Aeroscope Labs (www.aeroscope.io), a company I cofounded, we are taking advantage of many broader trends in the electronics market. Our Aeroscope oscilloscope probe is a battery-powered device in a pen-sized form factor that wirelessly syncs to a tablet or phone. It simply could not exist without the amazing advances in the tech sector of the past 10 years. Because of the rise of the Internet of Things (IoT), we have access to many great radio systems on a chip (SoCs) along with corresponding software stacks and drivers. We don’t have to develop a radio from scratch like one would have to do 20 years ago. The ubiquity of smart phones and tablets means that we don’t have to design and build our own display hardware or system software. Likewise, the popularity of portable electronics has pushed the cost of lithium polymer batteries way down. Without these new batteries, the battery life would be mere minutes instead of the multiple hours that we are able to achieve. Just as with my company, other new companies along with the major players will continue to leverage these broader trends to create exciting new instruments. I’m excited to see what is in store. 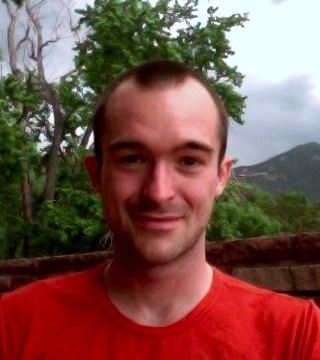 Jonathan Ward is cofounder of Aeroscope Labs (www.aeroscope.io), based in Boulder, CO. Aeroscope Labs is developing the world’s first wireless oscilloscope probe. Jonathan has always had a passion for measurement tools and equipment. He started his career at Agilent Technologies (now Keysight) designing high-performance spectrum analyzers. Most recently, Jonathan developed high-volume consumer electronics and portable chemical analysis equipment in the San Francisco Bay Area. In addition to his decade of industry experience, he holds an MS in Electrical Engineering from Columbia University and a BSEE from Case Western Reserve University. 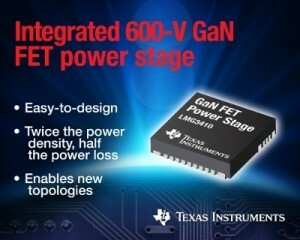 Texas Instruments recently announced the availability of 600-V gallium nitride (GaN) 70-mΩ field-effect transistor (FET) power-stage engineering samples. The 12-A LMG3410 power stage coupled with TI’s analog and digital power-conversion controllers enables you to create smaller, higher-performing designs compared to silicon FET-based solutions. These benefits are especially important in isolated high-voltage industrial, telecom, enterprise computing, and renewable energy applications. To support designers who are taking advantage of GaN technology in their power designs, TI also launched new products to expand its GaN ecosystem. The LMG5200POLEVM-10, a 48-V to 1-V point-of-load (POL) evaluation module, will include the new TPS53632G GaN FET controller, paired with the 80-V LMG5200 GaN FET power stage. The solution allows for efficiency as high as 92% in industrial, telecom, and datacom applications. TI will offer a development kit that includes a half-bridge daughtercard and four LMG3410 IC samples. A second kit will include a system-level evaluation motherboard. When used together, the two kits enable immediate bench testing and design. The two development kits are available for $299 and $199, respectively. IAR Systems recently announced that IAR Embedded Workbench for ARM is now integrated with the NXP Semiconductors S32 Design Studio, which is an integrated development environment (IDE) for NXP’s automotive and ultra-reliable microcontrollers. In addition to functionality such as pin configurator, bootloader and motor control toolbox, it provides AUTOSAR Microcontroller Abstraction Layer (MCAL) support and AUTOSAR OS for the S32K product line tailored for automotive applications. By letting S32 Design Studio generate a project connection with IAR Embedded Workbench, the IAR C/C++ Compiler and the extensive C-SPY Debugger can be used to develop the application. 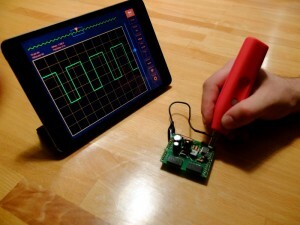 Adding a project connection will automatically include the generated code to the IAR Embedded Workbench project. If the files are changed from S32 Design Studio, they are updated automatically in IAR Embedded Workbench. Due to an integration of the build chain of IAR Embedded Workbench into the Eclipse-based S32 Design Studio, you can also opt to continue development within the S32 Design Studio while utilizing the IAR C/C++ Compiler. The C/C++ compiler and debugger toolchain IAR Embedded Workbench for ARM features comprehensive debugging possibilities and smart integrated profiling tools. It is available with build chain certification according to the automotive functional safety standard ISO 26262. In addition, IAR Systems offers fully integrated static and runtime analysis tools for complete code control. 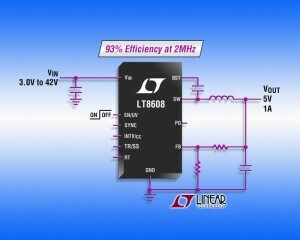 Linear Technology’s new LT8608 is a 1.5-A, 42-V input synchronous step-down switching regulator that delivers 93% efficiency while switching at 2 MHz. It is well suited for avoiding critical noise-sensitive frequency bands (e.g., AM radio) while using a compact footprint. Burst Mode operation keeps quiescent current under 2.5 µA in no-load standby conditions. Its 3-to-42-V input voltage range makes it ideal for automotive applications that must regulate through cold-crank and stop-start scenarios with minimum input voltages as low as 3 V and load dump transients in excess of 40 V. Its internal 2-A switches can deliver up to 1.5 A of continuous output current. The LT8608 maintains a minimum dropout voltage of only 200 mV (at 500 mA) under all conditions. Spread-spectrum frequency modulation and special design techniques offer low EMI operation. In addition, a fast minimum on-time of only 45 ns enables 2-MHz constant frequency switching from a 16-V input to a 1.5-V output. The LT8608’s 10-lead thermally enhanced MSOP package and high switching frequency keeps external inductors and capacitors small for a thermally efficient footprint. IAR Systems now supports Silicon Labs Wireless Gecko SoCs, which provide scalable solutions and include Thread and ZigBee stacks for mesh networks, intuitive radio interface software for proprietary protocols, and Bluetooth Low Energy technology for point-to-point connectivity. The IAR Embedded Workbench development provides extensive debugging and profiling possibilities such as complex code and data breakpoints, run-time stack analysis, call stack visualization, code coverage analysis, and integrated monitoring of power consumption. IAR Systems also offers integrated add-on tools for static analysis and run-time analysis. Support for the Wireless Gecko SoCs is available using IAR Embedded Workbench for ARM, from version 7.60. Free trial versions are available. Renesas Electronics Corporation recently announced a high-efficiency power supply IC the that supports the Power Rules requirements as defined in USB Power Delivery (USB PD) 2.0 and 3.0 specifications from the USB Implementers Forum (USB-IF). Engineers can use the RAA230161 IC with a wide variety of equipment that uses DC power, such as PC peripheral equipment, office equipment, hub applications, and more. With the IC, system manufacturers can safely implement reliable power supply equipment based on the USB PD 2.0 and 3.0 specifications. Samples of the RAA230161 are currently. Mass production is scheduled to begin in September 2016 with a volume of 500,000 units per month. Engineer and author Robert Lacoste has been designing and innovating for more than two decades. Fortunately for us, Robert is also an excellent writer who regularly publishes Circuit Cellar articles on the “dark” and difficult side of engineering. Over the years, he has taught us about topics ranging from direct digital synthesis to RF mixers to bipolar transistor biasing. This week, Robert gives us a tour of his consulting company, Alciom, which is based just outside of Paris. He also talks about his electronics equipment and his love for difficult projects. 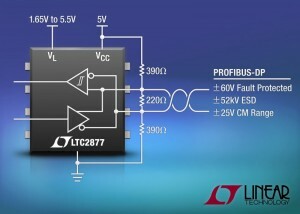 Linear Technology recently introduced the LTC2876 and LTC2877, which are high-voltage-tolerant RS-485 transceivers targeted for PROFIBUS-DP (decentralized periphery) networks. Whether transmitting, receiving, in standby or powered off, the LTC2876 and LTC2877 tolerate ±60 V on their bus pins, eliminating common damage due to transmission line faults. 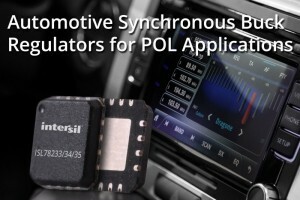 Intersil Corp. recently announced a new family of monolithic synchronous buck regulators that step-down 5- and 3.3-V primary rails to point-of-load (POL) inputs as low as 0.6 V for GPUs, DSPs, SoCs,and FPGAs. The pin-compatible ISL78233, ISL78234, and ISL78235 deliver 3, 4, and 5 A, respectively, of continuous output current to infotainment head units and advanced driver assistance systems (ADAS). Using a current mode control architecture to deliver fast transient response and excellent loop stability, the ISL7823x synchronous step-down DC/DC converters integrate low RDSon high-side PMOS and low-side NMOS MOSFETs. Moreover, they combine a switching frequency of 2 MHz with guaranteed 100 ns (max) minimum on time to avoid AM radio channel interference. The ISL78235 5-A synchronous buck regulator is available in a 5 mm × 5 mm 16-lead WFQFN package for $2.75 in 1,00-unit quantities. A 3 mm × 3 mm TQFN package is also available. The ISL78235EVAL2Z evaluation board costs $67.80. The ISL78233 3-A and ISL78234 4-A synchronous buck regulators are available now in 5 mm × 5 mm 16-lead WFQFN packages. 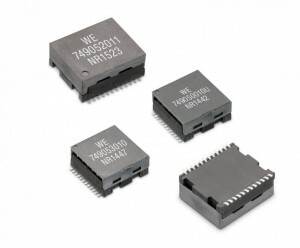 The ISL78233 costs $1.75 in 1,000-unit quantities. The ISL78234 is $1.95 in 1,000-unit quantities. The ISL78233EVAL2Z and ISL78234EVAL2Z evaluation boards cost $56 each. BittWare recently announced upcoming availability of an OpenPOWER CAPI Developer’s Kit for its Xilinx FPGA-enabled accelerator cards. The kit is intended to give you a fast way to connect the Xilinx All Programmable FPGA to a CAPI-enabled IBM POWER8 system. BittWare’s OpenPOWER CAPI Developer’s Kit is scheduled to be available in Q2 2016. ADLINK Technology recently released four embedded computing solutions designed with the Intel Atom x5-E8000 processor. The newly-updated COM Express cExpress-BW, SMARC LEC-BW, Qseven Q7-BW modules, and the AmITX-BW-I thin Mini-ITX embedded board offer improved cost-performance ratios. The latest Intel Atom SoC features 64-bit quad-core processing that is well suited for multitasking applications. The processor offers a configurable TDP (cTDP) of 5 W at 1.04 GHz, enabled by its 14-nm core transistors. With the new processor, ADLINK embedded boards and modules support up to 8 GB of dual-channel DDR3L 1600-MHz memory and up to three independent displays with Intel HD graphics. The new COM modules and Mini-ITX board run graphics processing on a base frequency of 320 MHz with eDP/DP/HDMI interfaces for up to three display ports, which is an increase in the number of ports over previous COM Express modules. In addition to 4K resolution, Intel Gen9 Iris Graphics offer excellent 2D/3D hardware acceleration with decoding support for HEVC H.265, MPEG2, MVC, VC-1, WMV9, JPEG, and VP8, and encoding support for HEVC H.265 MVC, and JPEG. Graphics support also includes Open GL for graphics rendering, Intel Quick Sync Video for fast conversion to mobile format, and Intel clear Video HD Technology for better quality video. ADLINK embedded boards and modules are equipped with ADLINK’s Smart Embedded Management Agent (SEMA), which provides detailed device-level system data including but not limited to temperature, voltage, and power consumption. With access to system activities, you can identify inefficiencies and malfunctions in real-time, thus preventing failures and minimizing downtime. ADLINK’s SEMA-equipped devices connect seamlessly to the SEMA Cloud for remote monitoring. Collected data, including sensor measurements and management commands, are accessible from anywhere at any time via an encrypted connection. Würth Elektronik has expanded its portfolio of Ethernet modules with LAN transformers for speeds of up to 10 Gbps. The new transformers support Power over Ethernet (PoE) up to 100 W and currents up to 1 A per channel. WE-LAN 10G has a bandwidth of up to 500 MHz and thus conforms to the IEEE Standard 802.3 with a bandwidth 3.5× larger than comparable gigabit Ethernet products. Thus, the transformers are well suited for applications involving large data volumes or requiring a swift transmission of data (e.g., the transmission of HD video data). In addition, the extended temperature range makes the modules a good option for industrial applications. IAR Systems recently announced an updated version of its C/C++ compiler and debugger toolchain for developing ARM-based embedded applications. IAR Embedded Workbench for ARM Version 7.60 adds flash breakpoints functionality and extended static analysis in C-STAT, which performs an analysis on the source code level. In addition to helping developers in ensuring the code quality early in the development cycle, it also detects defects, bugs, and security vulnerabilities as defined by CERT C/C++ and the Common Weakness Enumeration (CWE). It also helps keep code compliant to coding standards such as MISRA C:2004, MISRA C++:2008, and MISRA C:2012. C-STAT is fully integrated in the IAR Embedded Workbench IDE. The new update extends the tool with approximately 150 new checks, including 90 new MISRA C:2012 checks and two new packages of checks. Furthermore, there are new options for enabling or disabling the false-positives elimination phase of the analysis and excluding files from the analysis. The flash breakpoints enable developers to set an unlimited number of breakpoints when debugging the flash memory. With the C-SPY Debugger in IAR Embedded Workbench, you can set various types of breakpoints in the applications you’re debugging. If you use IAR Embedded Workbench with IAR’s I-jet debug probe, you can add an unlimited number of flash breakpoints for selected ARM Cortex-M devices. By setting breakpoints, investigating the status of an application and speeding up the debugging phase is straightforward. IAR Embedded Workbench for ARM is a handy tool that incorporates a compiler, an assembler, a linker and a debugger into one easy-to-use IDE. It provides advanced and highly efficient optimization features and is tightly integrated with hardware, RTOS products, and middleware. C-STAT is available as an add-on product. 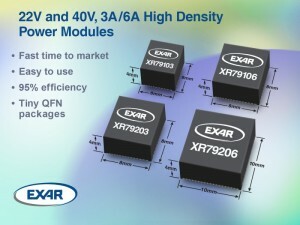 Exar Corp. recently announced additions to its family of synchronous step-down power modules with input voltage up to 40 V: XR79103, XR79106, XR79203, and XR79206. The XR79103 and XR79106 operate from a 4.5-to-22-V input supply, delivering a regulated output adjustable between 0.6 and 5.5 V. With a 40-V maximum input voltage, the XR79203 and XR79206 add the ability to convert from loosely regulated 24 VDC, rectified 18 VAC and 24 VAC sources. The output voltage can be set from 0.6 to 13.2 V.
With Exar’s emulated current mode constant on-time (COT) control, the power modules have fast transient response of conventional COT control loops and provide excellent line and load regulation performance. The modules offer a host of supervisory and protection features for proper sequencing, safe operation under abnormal operating conditions, and light load operation. The combination of wide input voltage range, a thermally efficient package, tight regulation accuracy, and small size makes the power modules well suited for communications, drones, remote vehicles, and a variety of other applications. The XR79103 (6 mm × 6 mm × 4 mm), XR79106 (8 mm × 8 mm × 4 mm), XR79203 (8 mm × 8 mm × 4 mm) and XR79206 (10 mm × 10 mm × 4 mm) are available in RoHS-compliant, green/halogen free, space-saving QFN packages. Prices start at $4.25, $5.40, $8.50n and $9.95, respectively, in quantities of 1,000.